Maybe we’ll stay at home this year! Twenty-one anglers from the Howth Sea Angling Club in Dublin, including Derek Evans, the Irish Times angling correspondent, recently travelled to the Canary Islands for a one week angling expedition in search of tuna. Tuna fishing has a special attraction and even though anglers in other boats landed tuna up to 127 kg in weight, the Howth contingent was unsuccessful and had to be content with exotic species such as red snapper, puffer and bonito in addition to less exotic species including scad, spurdog, sting ray and eels. Despite the absence of tuna from their catches the party was well pleased with the “craic” in the Canaries! But why travel to foreign destinations when all the while tuna are virtually on our own doorstep? Recently, Derek Noble proved the sceptics wrong. Setting out in a south-westerly direction off the Skelligs aboard his vessel Nicolisa out from Caherciveen, Co. Kerry he journeyed out about 60 miles and achieved a truly remarkable feat. 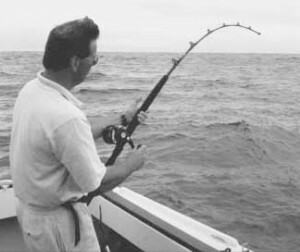 Tackle comprised five rods, two attached to outriggers and three on the stern, each trailing American tango-type lures rigged in a “daisy chain” pattern. Rods were Penn 20-45 lb medium tuna class and Penn GLS 45 reels loaded with Dynon 3000 braid. Derek Noble stuck in a big one! The first strike came at 11.20 am resulting in a fine 12 lb albacore tuna. Twenty minutes later another strike, this time a fish of 18 lb. The next strike came at 12.30 pm but was unfortunately lost. By 4.30 pm five tuna had been boated and before heading for home another fish hit one of the stern rods and 20 minutes later, a tuna of 25 lb was on board. Derek is convinced the area holds sailfish and swordfish and has plans for more outings in 2000. Indeed a recent report prepared by the Institute of Technology, Tralee for Central Fisheries Board and Bord Iascaigh Mhara recommends that big game fishing for tuna (albacore and possibly blue fin) and swordfish should be researched with a view to further enhancing this market. Derek has shown that it can be done. The major challenge is the distances involved but recent developments point to exciting possibilities. Sightings of blue fin tuna, including “boiling water,” in Donegal Bay in September 1999 were reported by several charter boat skippers. One even tried trolling but with no success. In the same month up to twenty blue fin weighing up to 700 lbs. each were taken by commercial boats fishing for scad at night some eight miles north of Downings. Although blue fin are listed on the Irish Specimen Fish Committee’s marine list, the other species like tuna, sailfish and swordfish are not. Who will be the first angler to set up a new class? In 2000 the bluefin tuna fishery took off in Donegal with fish to almost 1000lbs being boated. 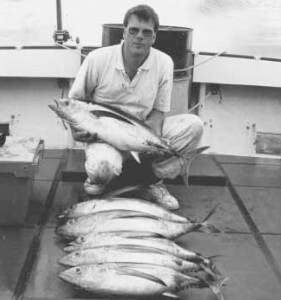 Albacore catches continue to feature off the South West coast and in 2003 a 36 lb fish was caught. Dreams of the first Irish swordfish grow.